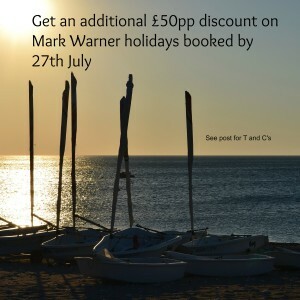 Fancy a Mark Warner Holiday this year? I’m really pleased to able to offer a £50pp discount on all Summer 15 & 16 bookings made by 27th July. Not valid for free child place and can’t be offered in retrospect. You can read our full review of the beautiful Levante Beach Resort here. We have loved our last two holidays with Mark Warner. The flight and transfer are well organised and easy even with three kids in tow, the resorts spotlessly clean, childcare AMAZING and there are so many exciting activities available that you’ll never run out of things to do. I’d especially recommend the introduction to windsurfing and paddle boarding, the exercise classes, bike rides and tennis socials.